Everything that touches your baby’s skin should be as comforting as your first loving touch. 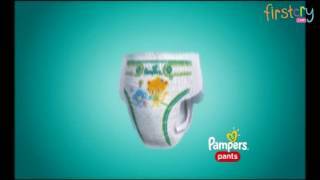 That’s why Pampers – the No.1 Choice of Doctors* bring you New Premium Care Pants. Made with select cotton-like materials, they are crafted with a soft and stretchy belt to provide comfort to your baby’s skin. It’s the 5-star protection your little one deserves from day one. *Based on ‘Nielsen India February 2018 Survey’ among 199 pediatricians from metros who recommend diapers. 1. Cotton-Like Softness – Select cotton-like material provides softness and comfort. 2. 3 Absorbing Channels – Distribute wetness evenly and lock it away to keep your baby’s skin dry. 3. Top Dry layer – Helps absorbs wetness to keep your baby’s skin dry and comfortable. 4. Breathable Materials – 1 Million micro pores let fresh air in so your baby’s skin can breathe easily. 5. S-Curve Design – Gently follows his every move to protect his skin from friction. 6. Baby Lotion – Infused with mild lotion to help protect your baby’s delicate skin from irritation. 7. Wetness Indicator – Turns from yellow to blue indicating when it may be time to change the diaper.